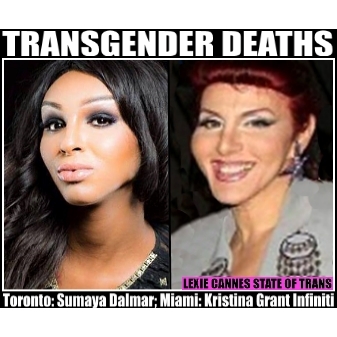 LEXIE CANNES STATE OF TRANS — The past week brought to our attention the death of two trans women. Contrary to reports on social media, one may not be a homicide. In Miami, Florida, Kristina Grant Infiniti, (aka Kristina Gomez Reinwald) was found dead in her home just over a week ago. According to the Miami Herald, police classified the death as a homicide, but they have not released any other details regarding the crime. In Toronto, Ontario, Sumaya Dalmar, (aka Sumaya Ysl) was found dead on Sunday Feb 22. Police have not released details regarding her death except to say that there is no evidence to suggest the death is suspicious. Toxicology tests are pending and an autopsy was inconclusive. Commentary by police hints that no foul play was involved. Stay tuned. To be balanced and trustworthy it is absolutely essential that the Transgender Community look upon all these death incidents from the proper perspectives. The social media is not necessarily the best place to glean information as there is a tendency, I find anyway, to jump to conclusions without having all the necessary information. The terrible part of the saying, “It must be true because I heard it on the internet,” is the accuracy of the joke. People in a primarily anonymous social situation vie, like the old tyme gossiping women at the back fence, to be the first with the most outrageous “news,” facts be damned, That is why we need the investigative, researched news reports of Lexie Cannes State of Trans, and her equals. Murders of transpeople are horrible and so very upsetting as they seem to never cease, no matter how hard we try to educate the world and attempt to insure both positive reporting and proper police investigation. And deaths of transpeople are also horrible and require the same efforts. But we in the Transgender Community need to understand that every death of one of our sisters (and sometimes our brothers) are not always a hate crime – well, not in the United States and Canada, usually. We must place in our minds the concept often the deaths are like other deaths of “non-trans” people in similar situations. This would included extensions of domestic violence, drug usage, or just being in the wrong place at the wrong time. But this is certainly an argument not intended in any way to minimize the importance of stopping the deaths of trans-people, but it is an attempt to show we must understand the causes. It is certainly never enough to read of the death of yet another trans-person, and to start screaming “enough,” Everyone of us has a social responsibility to first understand the causes, and then to work to fix whatever can be corrected. Yelling on the internet is not productive.